Hydro excavation technology offers a variety of hydrovac applications across entire industries. In a time of heightened pipeline damage prevention awareness, more and more plants and refineries, general contractors, engineering firms, even small two-men-and-a-backhoe companies, are taking less risk when it comes to digging around volatile underground utilities. 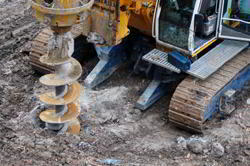 Traditionally, when it came to excavation, construction companies would conduct a One Call, as required by federal law, and then proceed to dig using a backhoe, track hoe, dozer, driller, trencher or some other mechanical means. Utility strike mitigation was pretty much limited to the response and accuracy of pipeline locators, as-builds, drawings and spotters. The digger and the spotter worked together to achieve the desired excavation. The problem with this approach is that, if done correctly, according to OHSA standards, it can be a painstakingly slow, and thereby expensive, process. Even then, there are no guarantees that a known or unknown utility will not be breached. Miscommunication between the equipment operator and the spotter has resulted in disastrous, even deadly, breaches. Pressure from construction superintendents to get the excavation done quickly tend to create an atmosphere of corporate non-compliance, particularly when workers fear that they will lose their job if they do not accept the risk of digging faster, without a spotter or without conducting a One Call. There are just so many things that can go wrong and that have gone wrong in the past. That is why the advent of hydro excavation technology some 50 years ago is revolutionizing the manner in which compacted soil is removed from around buried utilities. For more information about hydro excavation applications for a particular industry, click one of the links on the left and/or contact Hydro Spy Vacuum Excavation Services day or night to learn how we can facilitate a successful outcome on your project.